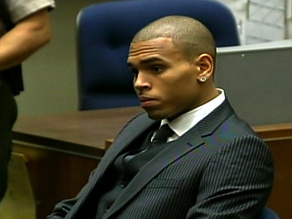 Chris Brown sentenced to five years probation and "labor-oriented service"
LOS ANGELES, California (CNN) -- Pop singer Chris Brown was sentenced Tuesday to serve five years probation and to spend more than 1,400 hours in "labor-oriented service" for assaulting his pop star girlfriend, Rihanna. Chris Brown received an expected sentence on Tuesday of probation and community service. Also Tuesday, CNN obtained a probation report for Brown that says the pair were involved in at least two other domestic violence incidents before the February attack for which Brown was sentenced. The probation report, which CNN obtained after Brown's sentencing, was used to reach his plea agreement. Police investigating the February 8 attack "learned of two earlier incidents related to domestic violence that went unreported," the probation report said. "The first incident occurred in Europe about three months before the present offense," the report said. "The victim [Rihanna] and the defendant [Brown] were involved in a verbal dispute and the victim [Rihanna] slapped the defendant [Brown]. He responded by shoving her into a wall." Another incident happened in January, three weeks before the Hollywood incident, when Brown and Rihanna were visiting her home country of Barbados, the report said. "The defendant [Brown] and the victim [Rihanna] were visiting Barbados and were driving a Range Rover loaned to them by a local dealership," the investigator wrote. "They had an argument inside the car. The defendant [Brown] exited and broke the front driver and passenger side windows of the car." At Tuesday's sentencing, Los Angeles Superior Court Judge Patricia Schnegg said she wants to see Brown do "actual physical labor, as opposed to some type of community service." The sentencing was delayed earlier this month because documents detailing Brown's proposed community service plan in Virginia, where he maintains a legal residence and wants to serve his sentence, had not arrived in time for Schnegg to review. Brown's probation will be overseen by the state of California, the judge said. Brown must also complete domestic violence counseling. Schnegg also put a restraining order in place, requiring Brown to stay 50 yards away from Rihanna, 10 yards if the two are at the same industry event. The judge issued a strict warning to Brown not to violate the order, which remains in place until 2014. Rihanna's attorney, Donald Etra, would not say whether she wanted the restraining order lifted, but if Rihanna wants the order modified she must personally appear in court to request it, Etra said. According to Brown's probation report, the February argument began over an incident at a Beverly Hills party. An earlier, sworn statement by Los Angeles Police detective DeShon Andrews said the incident began when Rihanna found a text message on his cell phone from "a woman who Brown had a previous sexual relationship with." The pair argued while in a sports car driven by Brown, the police statement said. It went on to describe the assault in great detail, saying Brown punched Rihanna -- identified in the statement as Robyn F. -- numerous times and put her in a head lock, restricting her breathing and causing her to start to lose consciousness. He threatened to beat her and kill her, according to the statement, and he bit her ear and her fingers. Eventually, the statement said, "Robyn F. began screaming for help and Brown exited the vehicle and walked away. A resident in the neighborhood heard Robyn F.'s plea for help and called 911, causing a police response. An investigation was conducted and Robyn F. was issued a domestic violence emergency protective order." The detective said Brown sent a text message nine days later, apologizing. Rihanna's injuries included cuts and bruises inflicted by a large ring on Brown's right hand, which he used to punch her, the probation report said. "Officers at the scene observed numerous contusions and abrasions to the victim's face and forehead, as well as bruising to her left arm near the bicep," it said. "They also saw abrasions to her arms near both wrists and on her upper chest near her collarbone and around her neck. There were abrasions on her left leg and on the inside of her upper lips." Rihanna declined to speak to the probation investigator, so the probation report's details were gathered from police detectives who interviewed her soon after the attack. "He beat me up," Rihanna told the police, the report said. Brown made a public apology last month in a video statement posted on his personal Web site. "I have told Rihanna countless times, and I'm telling you today, that I'm truly, truly sorry in that I wasn't able to handle the situation both differently and better," Brown said. "What I did was unacceptable, 100 percent. I can only ask and pray that you forgive me. Please."